“Shortly after the first mechanical clocks were invented in the 14th century, inventors started looking for ways to represent the motion of the heavens. Thus, the astronomy clock was created. Perhaps the best known astronomy clock was created in Prague in about 1410. Instead of just showing what time it is, it also shows the relative position of the stars as the Earth rotates on its axis and revolves around the Sun. In this project, you will learn how to create an astronomy clock that you can have in your home. 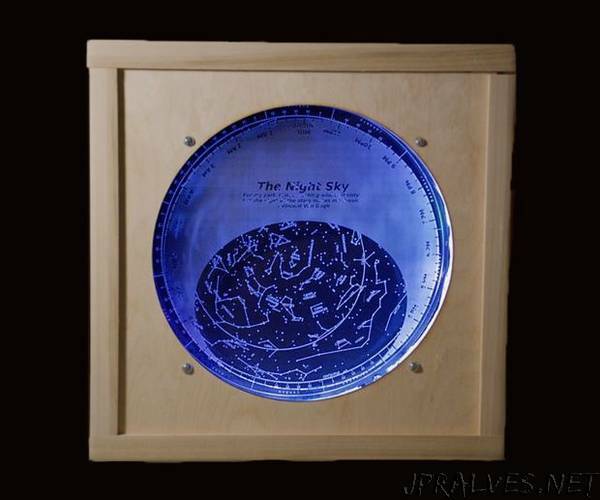 It displays a map of the stars that are currently in the sky - day or night. The sky map changes as the earth rotates. The project involves mechanical, electronic, and software components. You will need access to a 3d printer, a laser cutter, and some woodworking tools to finish the project. I also used Python to create the star maps and design incorporated in the clock. Perhaps my favorite part of the project was integrating all these technologies together. This project was completely original. I wrote the software to run the clock, created the laser designs for the case, and even built the gears and drive train. I also wrote the software to do the layout of the star map.